Dalat highlight city tours and countryside tours ($50~$60) are multi options for you to see and enjoy all the time in the central highland. Our guides are the experts so we leave you in their hands to discuss and decide what you want to see and do today. For nature lovers like flower gardens, water falls, lakes. For architectural enthusiasts there is the Crazy House and the Railway station. Motorbikes - Easy riders are available as your wishes. Meet your guide at 8:30am at the hotel . Our guides are the experts so we leave you in their hands to discuss and decide what you want to see and do today. There are some great cultural places to visit, natural highlights and markets in the area. If you are in the mood to shop then you can visit the biggest market in Dalat, or the XQ Silk Embroidery Village. If you are interested in history and cultural heritage then we recommend that you take the time to visit highlights such as Bao Dai’s Summer Palace III, take the cable car to Truc Lam Meditation Pagoda, or Linh Phuoc Dragon Pagoda. For architectural enthusiasts there is the Crazy House and the Railway station. For nature lovers there is the flower garden, Datanla waterfalls .When you choose to have lunch is up to you. Chat with your guide and decide what suits you! Include : English speaking guide, private comfortable car suitable to group size, all entrance fees and tourist permits, drinking water. Not include: Meals, drinks other than water, personal expenses & tips. International insurance including evacuation coverage should be purchased before coming to Vietnam. Your guide will meet you at the hotel at 8:30am. Begin your journey to Tanung Village. Along the way there is so much to see and learn about countryside living and what is produced in the region: local vegetable & flower farms, pine trees, coffee plantations & an opportunity to try different kinds of coffee, rice wine making, cricket farm and local silk throwing factory. This morning you will travel through plantations and forests, see the spectacular Elephant waterfalls and the giant Buddha statue in Linh An Pagoda nearby. Lunch spot will be recommended by your guide . This afternoon on your return journey you will visit a local factory of Tea and Red Dalat Vang - winery testing – a nice place to rest and enjoy local product before arriving back at your hotel and rest as your leisure. Include : English speaking guide, private comfortable car suitable to group size, all entrance fees, tourist permits and drinking water. Your guide will meet you at 8:30 am. Begin your journey to Tanung Village. Along the way there is so much to see and learn about countryside living and what is produced in the region: vegetables, flowers, pine trees, coffee, rice wine, mushrooms, crickets and silk. This morning you will travel through plantations and forests, see the spectacular Elephant waterfall and the giant statues in Linh An Pagoda. In the afternoon, continue your way to the area of Pongour waterfalls. 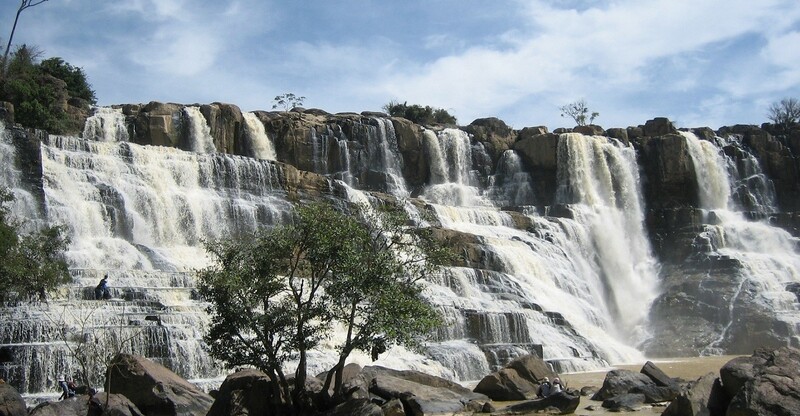 Located about 50 km south of Dalat, it is regarded as one of the most beautiful and imposing falls in the West Highland with about 40m in height and over 100m in width. Surrounded by 25 ha unspoiled forest, the waterfall slips into numerous sandstone stepping from top to bottom. Its massive water powerfully falling down seven floors produces sonorous sounds that can be heard from miles around. Return to Dalat in late afternoon. Include: English speaking guide, private comfortable car suitable to group size, all entrance fees and tourist permits, drinking water. Your guide will meet you at 8:30 am to begin your journey to the less visited area 12km north of Dalat. Your destination for the morning is Langbian Mountain, the highest summit in the south of Vietnam (2,169 m above sea level). On the way you will take a break at Dankia Lakes and Golden Valley at the foot of the mountain. You have a jeep available, but let your guide know if you would prefer to trek part of the way up (about 1.5 to 2 hrs, 350 m). Enjoy your picnic lunch on the mountain. At the summit, Rada Peak, you have a 360 degree vista of the surrounding countryside and great photo opportunities. Take a rest to admire the view before descending to visit Lat village (wooden church, furnishings and clothes woven by hand). Back in Dalat around mid-afternoon visit Crazy House, the XQ Silk Embroidery Village and the Dalat Center market.